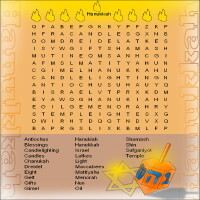 What better way to celebrate the Festival of Lights than with this fun and challenging word search. Find the twenty four words hidden in the letter grid using the word list below it. Do it all in one night or spread the fun over all eight! There is also an answer key in this free downloadable PDF. Click on the thumbnail to download the word search PDF file.